A New Hotel Located in Central Coast Wine Country Experience our boutique amenities, central location and the warm service our guests return for. Locally owned and operated, our custom designed interiors and wine country ambiance accentuates your stay on the beautiful Central Coast. 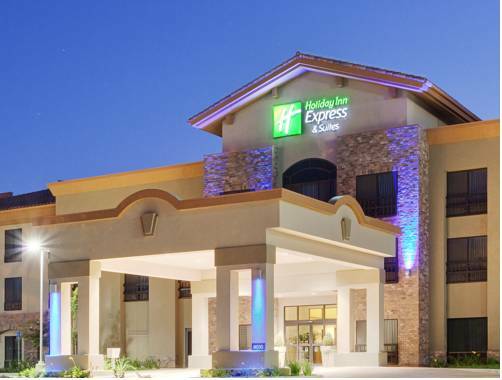 Whether traveling for business or leisure, Holiday Inn Express & Suites of Atascadero is just minutes away from award-winning wineries, scenic golf courses, sandy beaches, unique shopping, irresistible dining, Hearst Castle and more. You can start each morning with the Express Start complimentary hot breakfast featuring our signature cinnamon rolls, pancakes, and much more. Throughout your stay enjoy many of our hotel amenities which include Wi-Fi internet, an outdoor Heated Pool and Whirlpool Spa, a 24-hour Fitness Center & 24-hour Business Center, along with Guest Laundry. Our beautiful guest rooms feature microwaves & refrigerators, along with a wall-mounted flat screen plasma television and a relaxing granite shower with a Smart Showerhead by Kohler. Conference Room: Conference table seats 12 -14 with additional room for seating on side walls. Granite countertop for display/F&B. Wall-mounted flat screen TV. Limited selection of AV available for rent. Larger selection of AV available through local vendor. Breakfast Room: Large room with abundant natural light. Wall-mounted flat screen LCD TV included in rental. Limited selection of AV equipment available for rental onsite. Larger selection of AV equipment available to rent through outside vendor. Caladero Room: 1400 sq ft of flexible event space - Grand room to board room. Abundant natural light and black out shades. Chalk Mountain Golf CourseLocated in Atascadero, Chalk Mountain Golf Course is one of the areas premier golf destinations. A fun and challenging course for all levels, the golf course is situated amongst ancient and mature oak trees, sweeping hills, and a meandering creek. Galaxy TheatersThe most technologically advanced theatre on the West Coast. This brand new state-of-the-art theatre features D-Box and VIP lounge serving local beer and wines. Atascadero Wine FestivalAtascadero Lakeside Wine Festival is held at the Atascadero Lake Park in June of each year. Wine Country Paso RoblesAward Winning Ancient Peaks Winery is the closest winery to the Hotel.